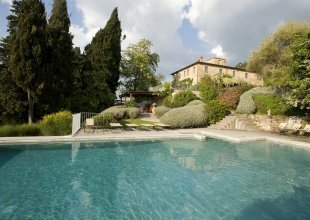 Blissfully set amongst some of Tuscany's most verdant countryside, with views of charmingly castellated hilltops, Tenuta Cantata has the charm and understated elegance of a lovingly designed country home. Roughly hewn oak-beamed ceilings and stone lintels and floors share a palette of tones with lovingly chosen fabrics and furnishings. The house feels like a real home, with bags of space and a wonderful understated elegance. It is fresh and full of charm, and although you'll fall in love with the beautifully concocted interiors, you'll be constantly drawn to the views through the windows and from the first floor terraces that overlook miles of far reaching countryside. A wonderful setting for evening drinks, where your eyes can't help but meander over the brightly lit castellated hilltops and their deeply lined valleys below. Far from being caught in time itself, the house belies its roughly hewn oak rafters, honey-coloured stone clad floors and solid country beams by embracing modernity. There's WiFi throughout, a fully equipped kitchen with a range of features, from a 6 range stove top, induction hot plate and 2 ovens, to a dishwasher and large refrigerator/ freezer. In the bathrooms there are large walk in showers, all ensuring that the place is ideally set up for a full house of guests. Elsewhere around the house, the drawing room has some suitably deep, comfortable sofas, and an inspiring collection of artwork. On this floor there's also a charming and characterful study for those wanting to tuck themselves away for a few hours. Furthermore, the upstairs galleried sitting room, with more sofas, is a beautiful space to escape from the world. 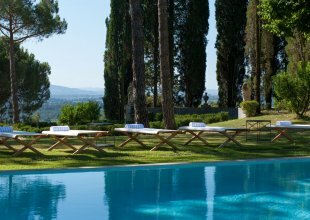 One of the property's most striking features is its beautiful arched loggia with a huge reclaimed oak table and, most importantly, some sublime views over the pretty gardens and lawns, the olive trees and the infinity pool below. Outdoors, the estate comprises olive groves, meadows and woods, an idyllic setting offering some lovely walks as well as the serenity of a private lake. Closer to the property itself there's a superb tennis court (for exclusive use) and in the pretty gardens there's a lovely infinity edged swimming pool with a pool terrace that includes a shady seating area for those wanting to escape the hot sun. The property comes with daily maid service (6 days) and a cook service available on request. It takes a maximum of 12 guests. All bedrooms are individually decorated and full of charm, with four poster beds and antique furniture. The beautiful bathrooms have enormous walk in showers and free-standing roll top baths.